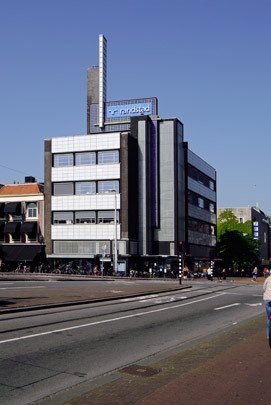 Buijs's part in the Social Democratic movement earned him a commission not only for the Arbeiderspers ('Workers Press') building in Amsterdam (since demolished) but also for the head office of the Volharding Cooperative Society. This society manufactured and sold products and provided services on a basis of collective organization and division of profits; by the workers, for the workers. The building was to accommodate offices, stores, a dental clinic and shops. Another condition was that it should offer as much opportunity for advertising as possible; this was to determine its outward appearance. Its reinforced concrete frame accommodates a functional interior, flexible through the use of lightweight wall partitions. Facades are fully glazed, horizontal strips for daylight alternating with 2 m. high illuminated bands of clouded glass that project 70 cm., allowing one person to enter and attach to rods letters and symbols in zinc. The corner stairtower and lift, also of glass, combine with the rooftop sign in a distinctive Cubist composition of glass brick and tiles. When lit up at night the building becomes a gigantic luminous billboard. After alterations in 1933 and 1938 and the cooperative's absorption in a sickness benefit association, such characteristic elements as its entrances and the advertisements on its facade and roof either disappeared or were changed. During restoration in 1974 the building was refurbished as office premises. In its use of glass, glass brick and colour the Volharding is one of the earliest examples of building with glass and light, a true 'Workers' Cathedral'. Like everything else by Buijs it occupies a somewhat controversial, isolated place in Dutch architecture. In the 1930s, the Modern Movement's toughening attitude led to widespread criticism of its mixture of Nieuwe Zakelijkheid in the office section and the Expressionist aesthetics of its corner. Van Loghem in particular, in his influential book 'Bouwen, Bauen, Bâtir, Building', dismisses it as 'still decorative' and therefore no part of the Nieuwe Zakelijkheid. Then again, it came much too late for the Utopian Expressionism of German glass architecture. Only much later, especially with the revived interest in such international avant-garde movements as Futurism, Constructivism and De Stijl, would the building once more be the subject of acclaim.